The bishop of the Catholic Diocese of Salt Lake City and Bishop Jim Gonia of the Evangelical Lutheran Church of America’s Rocky Mountain Synod presided at the gathering at Zion Evangelical Lutheran Church, and each delivered a homily. Many clergy from both churches were in attendance. Congregants commemorated the 500th anniversary of the Reformation and celebrated the efforts at unity of the two churches in recent years. As the clergy processed in, many of those standing in the pews joined the choir in singing “In Christ Alone,” a hymn familiar to members of both churches. The choir was comprised of members of several Catholic and Lutheran churches. 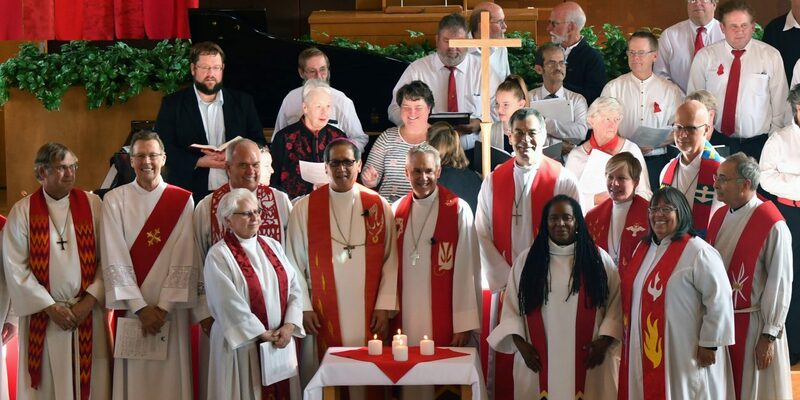 In recognition of the diverse nationalities represented by members of both churches, the call to worship and the second reading were given in Spanish, while the intercessory prayers were proclaimed in Spanish, Malagasy, Vietnamese, Tagalog, Korean, Portuguese and English. The program was bilingual, in English and Spanish. The polarization of society fragments the world, families, nations, politics, businesses and even sports, Bishop Solis said in his homily. Therefore, “our ecumenical prayer service is in noble pursuit of the Christian unity that our faith communities have been working toward, closely together, for several centuries now,” he said, adding that the human endeavor must be aided by the grace of God. In his homily, Bishop Gonia mentioned that the prayer service was the last of seven to take place in the Rocky Mountain Synod. The first took place in Santa Fe, New Mexico, and “you might know the archbishop, John Wester,” he said as the congregation laughed, recognizing the name of the previous Catholic bishop of the Utah diocese. “So there’s something beautiful about concluding this series of services here in Utah,” Bishop Gonia said. “As Lutherans and Catholics on this day in Salt Lake City, we’re making history, and history of a very good kind, and we give thanks to God for that,” Bishop Gonia added. His homily was a reflection on the Gospel reading of Jesus as the vine and his disciples as the branches from the Gospel of John. Noting that individual branches may look quite different, and even though they grow side by side, “it’s easy to forget that their source is the same,” Bishop Gonia said. At the prayer service, “we remember with joy and thanksgiving the truth of our unity and connectivity as two particular branches of this one vine, branches that we call Lutheran and Roman Catholic,” Bishop Gonia said. “After centuries of division and rhetoric that was anything but Christ-like,” he said, “in these last 50 years, our two particular church bodies have made incredible strides towards recognizing the one life we share in Jesus. In Utah, the Catholic and Lutheran churches already work together, “especially when it comes to advocating for brothers and sisters struggling with poverty and marginalization in our society,” Bishop Gonia said. He told the story of his father, who was an altar boy in the Catholic Church but was confirmed in the Lutheran Church so that he and his wife could be married in the same church. Later Mike Cena, a member of Zion Evangelical who frequently attends Mass with a Catholic friend, said the service was joyful because it made him think of his parents – one is Lutheran, the other Catholic. “In heaven, I know my parents are smiling, that we’re together in unity for the love of Christ,” he told the Intermountain Catholic, Salt Lake City’s diocesan newspaper. “I think that it’s the best thing that has happened in generations. It is wonderful. I wish we’d all get on one page,” said St. Vincent de Paul parishioner Rozanne Broomhead, who attended with her son and his wife, who are members of Zion Evangelical.